Should add an * to the tooltip and color it orange/purple for CE and AOTC. So many people have 1/9M, and their alts show that for their main's progress instead of 9/9H. This is an option to provide some meaningful info each while keeping the clutter in the tooltip low. There seems to be something wrong with the daily database refresh. It works for m+ but for raids it just won't update it. 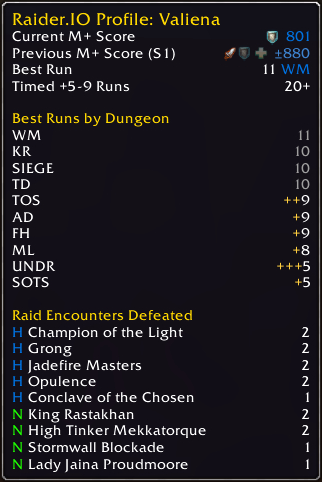 For quite some time, the in-game addon has shown my main's raid kill count as being 5 for almost every boss, and 2 on Jaina. 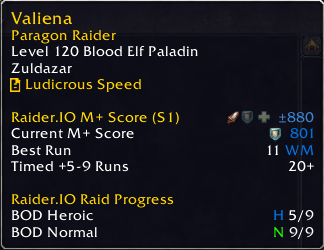 In reality, and on the raider.io website, on some bosses I have over 10 kills and on Jaina I have 4. Just found out that this garbage actually starts giving more than 10 points per key level for higher keys... I have made my peace with the system of having to run all dungeons, even if they have literally desirable 0 loot for me, only to get the average score to be even remotely invited into groups, even though i outgear 90% of them (ergo outperform 80% cuz I ain't the best player)... but all this time I thought the formula for giving points was constant.. and what do I find out.. barely timed 17s give 195+ points instead of 170.. this is low dude.. very low.. not only this addon introduced more toxicity by having the score in the first place, even though I understand that there must be some form of metric to be able to tell if a player can do the content they apply for.. but then to actually weigh it in favor of higher keys which only a small number of players does, while almost 3-chesting a 10 in a perfect run gives you a laughable 5 points over the 100... a real slap in the face bruh.. Please, please, please give me an option to hide s1 score if the current score is above a certain threshold or at least to hide s1 score all together. I dont care about last seasons score, especially if a player has a current score of over 1k i dont care about his last season score! The new changes do include this option. Open the RaiderIO config (/rio) and near the top there is a section about "Tooltip Headline". The default is to show the best score from current or previous season, but you can change this to only show the Current Season score, or to even just show the M+ Level of their Best Run in the current season. The only other place where a previous season score might show is for someone's Main. There is an option in the config to force that to only show current season too. There is not an option for disabling the best overall run. Have you considered expanding on this addon for PvP users to have it show RBG and arena ratings to show what the players current rating is for each tier (2's, 3's, RBGs) and what their highest rating in said tiers were? I think that would be pretty beneficial. Can have an on/off switch in the settings for those that dont wanna see that info or make an entirely seperate addon named like Arena IO or something that tracks only the pvp info side of things. Please see the comment in the original thread. Thanks for a nice addon! Hello. Any chance to make option to use full dungeon names? Russian translation makes it almost useless because short names are not common "short" names. Like wtf is "ПДГН" or "УУ"...? I'm renaming them manually in ruRU.lua, but addon updating too offen, so making it all the time is too time consuming. Thank you. I have trouble remembering the acronyms (English only speaker here) . My UI as plenty of space for full dungeon names so an option to display this would be useful to me. My BoD is not upgrading on my portrait in game. I am updating Raider IO everyday but it is still now showing the correct data. WoW progress is showing correct but Raider IO is not.